Momentum Convention: An Unconventional Celebration of Equity is a radical, interactive and inspiring celebration of equity in action. By bringing together diverse young leaders with engaged community members to share stories, learn from each other, and embrace Momentum Alliance’s core values—Intersectionality, Vulnerability as a Strength, Deep Relationships, Love, Shifting Power, and Valuing Everyone’s Story—Momentum Convention creates a unique opportunity to experience how we at MA live out equity in everything that we do. Contact dorian@momentumalliance.org to pre-order tickets!!! Who: Ethnic Studies Coalition, Oregon Students of Color Coalition, & the Oregon Equal Rights Alliance and YOU! Youth Equity Collaborative Self Care Month! The Youth Equity Collaborative will be hosting their first Self Care Day event, on April 1, 2017, at the APANO JAMS from 2:00-5:30pm. With the support of Northwest Health Foundation, Momentum Alliance convenes the Youth Equity Collaborative: a collaborative of five youth programs from Portland and around the state with the goal of building a regional intersectional youth-led social justice movement. For more information about the Youth Equity Collaborative, click here, and like us on Facebook! Click here to learn all about Spring Leadership Camp and to register! On March 22nd, MA youth will join the Oregon Housing Alliance for their lobby day to advocate for a number of bills that will help address the housing crisis in Oregon. Every Oregonian should have affordable and stable access to a home. 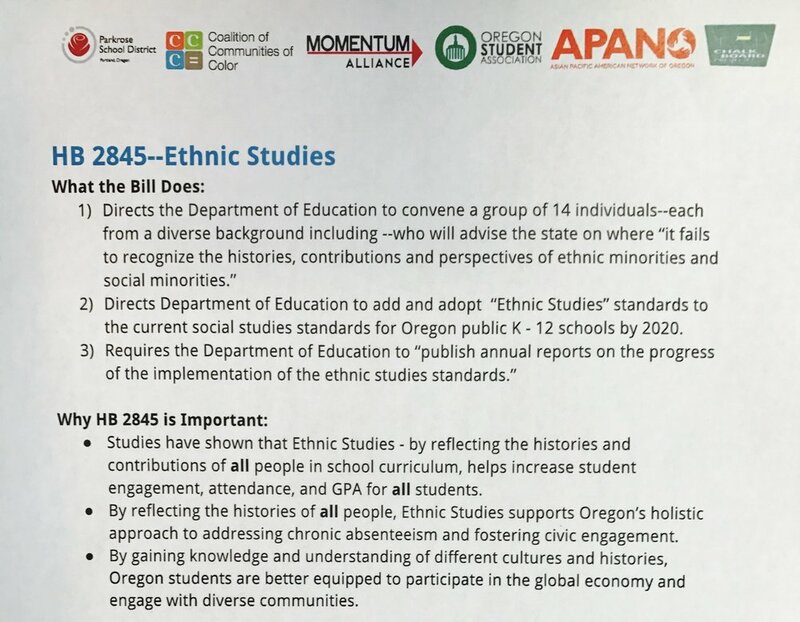 Momentum Alliance has been part of the Ethnic Studies Coalition working hard to get Ethnic Studies in ALL Oregon K-12 schools. As you know, the president and his administration, as well as Immigration and Customs Enforcement (ICE) are attacking undocumented immigrants and refugees. We are seeing increased ICE presence creating fear and separating families in other communities. In order to fight back and show our support for the undocumented community, Momentum Alliance is organizing a Coming Out of The Shadows rally on Monday, February 27th 11:00am at the ICE building in SW Portland. We are inviting our community and supporters to support this community as they come together to make their collective voice be heard. We invite the broader community to join us not to speak on our behalf, but rather to support us as we speak out for ourselves.